The editor of a satirical French magazine accused of insulting Muslims by reprinting cartoons of the Prophet Muhammad has been acquitted. A French court has ruled in favour of weekly Charlie Hebdo, rejecting accusations by Islamic groups who said it incited hatred against Muslims. 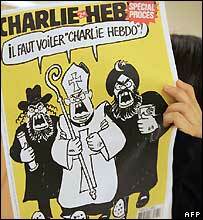 The cartoons were covered by freedom of expression laws and were not an attack on Islam, but fundamentalists, it said. The case was seen as an important test for freedom of expression in France. Applause broke out in the courtroom at the announcement of the verdict, which ruled that the three cartoons published in February 2006 were not insulting to the Muslim community, the AFP news agency reports. Editor Philippe Val had rejected the allegations, saying the cartoons were not an attack on Muslims, but on terrorists. He said the ruling was a victory for secular French Muslims. "This debate was necessary," he said. The case had been brought by the Grand Mosque of Paris and the Union of French Islamic Organisations. At a two-day trial last month, Mr Val said he had published the cartoons - which first appeared in Denmark in September 2005 - to denounce terrorism. Mr Val, the executive editor of the publication, was facing a maximum fine of nearly 30,000 euros (£20,000; $40,000) and a jail sentence of up to six months. Depictions of the human form are generally taboo in Islam. The cartoons, including one of the Prophet Muhammad with a headdress in the form of a bomb, triggered riots in some Muslim countries.